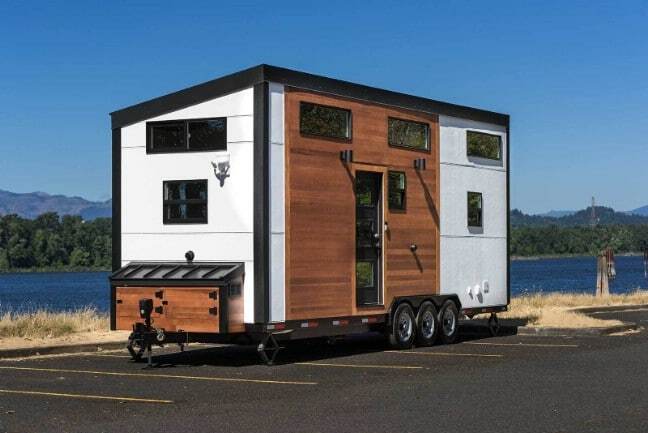 Tiny Innovations describes its flagship house as “a piece of modern architectural art.” While designing the home, called the “Catalina,” the company emphasized a union between form and function, paying close attention as well to materials and components. Let’s take a look. The Catalina can be ordered in three different sizes: 24’, 28’, and 32’. In this post, I’ll be sharing the details with you for the smallest of the three models, but the Tiny Innovations website includes full specs for every size available. The chassis which the Catalina is constructed on is handcrafted. The home’s framing is plywood and lumber, while the siding is knotty cedar T/G accent with either Hardi lap or board and batten siding—you get to decide which you prefer. You also can choose the exterior paint color which you like best. To keep the home warm, closed cell spray foam insulation is in not only the walls, but also the ceiling. The floor is rigid foam. The house is protected from precipitation by WeatherSmart or DuPont Tyvek HomeWrap. The windows are Milgard Styline, and are built to withstand severe weather, keeping heat inside your house to reduce your energy bill. 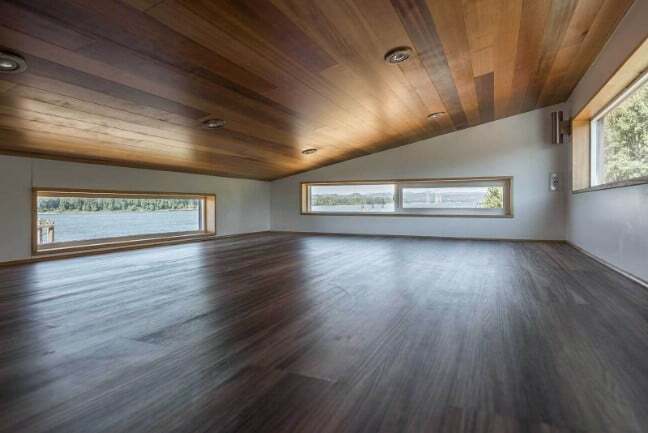 This house features two lofts, and from the looks of things, they are both pretty large. 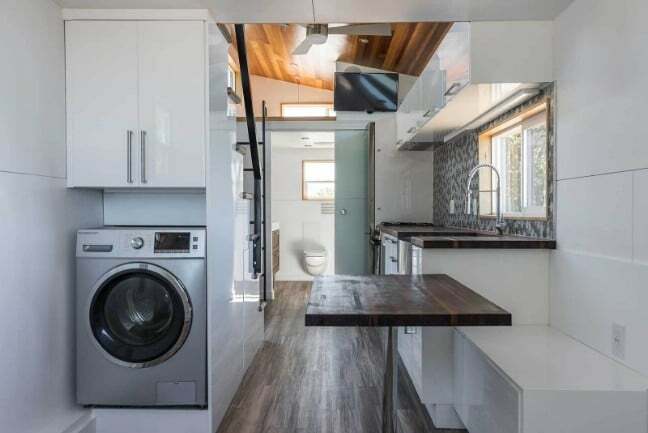 In this photo, you can also glimpse the bathroom, which features an 18-24” vanity and a 60” acrylic bathtub and shower unit. The toilet is dual flush. Modern minimalism is emphasized in the right angles and simple lines of the home, though the house retains a very “homey” vibe in keeping with traditional abodes. Notice how surfaces and objects are kept “thin” so as to keep the space as open as possible. This includes the table, for example, and the ladder which leads up to the back loft. What stands out in this photo of the kitchen is of course the backsplash, which is a work of art in and of itself. 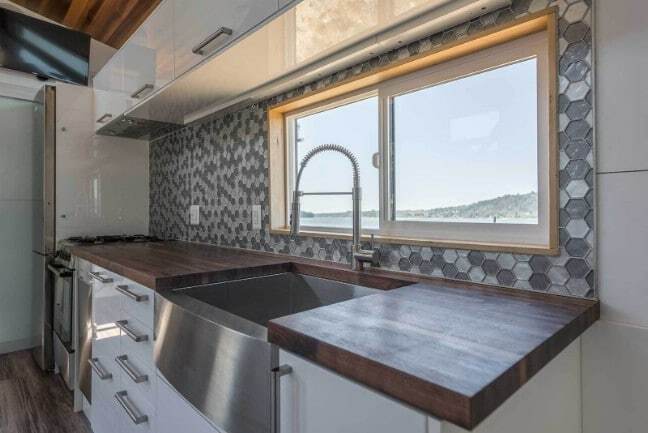 But you also will take note of the large, stainless steel sink, propane stove and oven, and the full-size fridge. You already saw the smaller loft before in one of the previous photos, so here is one of the larger loft. 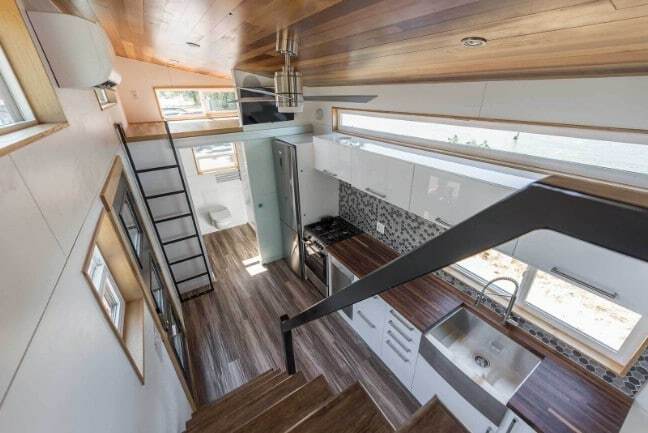 It is hard to get a feel for the dimensions without a bed in the shot, but it looks like you could fit a large, comfortable mattress in here without a problem. Thinking about purchasing the Catalina? The model starts at $65,000, and can be customized with a wide variety of features. You can for example upgrade it by ordering a washer and dryer (as you saw in the photos) and a flat-screen TV. If there is a feature you are after which isn’t mentioned on the site, you can request it. You also can apply for financing with an APR starting at just 4.49% if you need it. Ready to learn more? Visit Tiny Innovations, and explore the full details for the Catalina. You can contact the company directly through the site and check out their other models there as well.